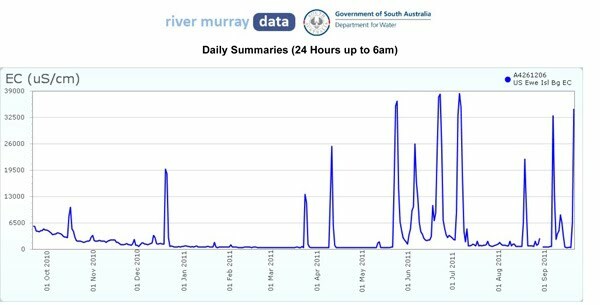 I was surprised that the latest storms had such in impact on water quality upstream of the Goolwa Barrage with salinities reaching 5000 EC at the Hindmarsh Island Bridge even though the Goolwa Barrage was completely closed. Could it be a combination of leakage through and under the Barrage and sand dunes, groundwater and possibly fish passages? Attached is the latest plot from 1.5km upstream of the Ewe Island Barrage. This plot which is being added to continuously seems to encapsulate the impact of sea water inflows even though the period is during high river flows.